One of the most asked questions that I receive from people is about publishing a book. 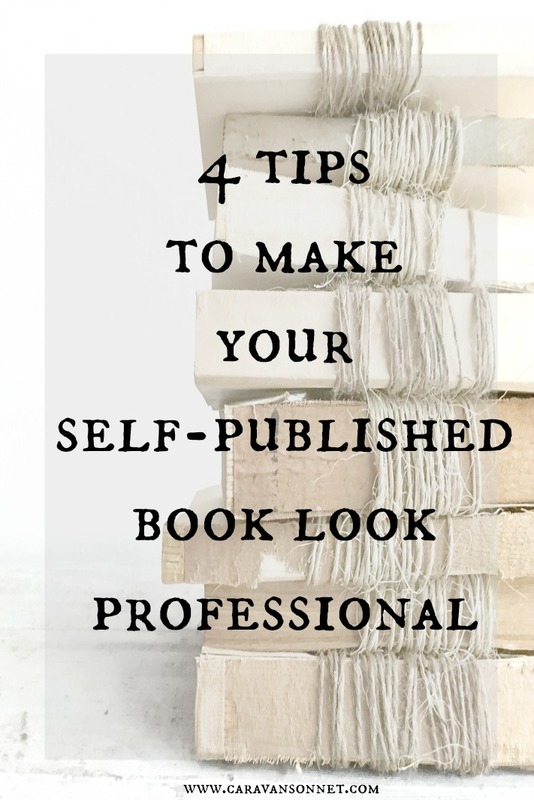 So today I wanted to share 4 tips to make your self-published book look professional. I will be sharing more thoughts on getting a book contract in the coming weeks. As most of y'all know I have actually done both traditional publishing (accepting a contract from a book publishing company) and have also independently published my book using Amazon's CreateSpace website. I hope that these tips will help y'all as you embark on this exciting adventure! One of the most asked questions that I receive about the books that I have chosen to independently publish is how I have made them "look" professional. In my post entitled 20 Tips for Successfully Self-Publishing your Book (or E-book) my second tip was take the time to make your book look professional. The reason that I had this as my second tip was very simple. In a day and age when even well-known authors are independently publishing their books you want to make sure that your book looks professional (or more professional!) than your competitors. Gone are the days when you are a lonely island self-publishing your work. In today's market it is wise to build a team that will help make your book the success that you want it to be. So here are 4 tips on making your self-published book look professional. 1. Edit, Edit again, Edit some more, and Keep Editing. Often one of the biggest mistakes that a self-published author makes is not spending the time to properly edit their book. Take the time to edit and make sure that this is your first priority before publishing. Spend the money to hire a professional editor. Don't have the money for a professional editor? Check out your local colleges and graduate school programs and contact the English and Journalism departments. Many times professors, TA's, or graduate students are looking to earn a little bit of money or build up their resume and will offer their services at a reduced rate. Anyone who knows me that editing is my least favorite part of the writing process. By the time that I have spent 6-7 months editing (sometimes much more!) I am literally over the book. *smiles* I once heard a well known and famous author say that he never re-read his books once they were published because he could quote them due to all of the editing. I didn't understand his comment until I became an author and now I completely get it. Know your work so well that by the time that you are done you could quote the masterpiece that you have created. 2. Always Review a Physical Copy of your Book Before it goes to Print. One of the most important pieces of advice that I give to everyone who wants to self-publish a book is to always review a physical copy of your book before it goes to print. I know to many self-published authors that have gone ahead and hit the "approved" button without reviewing a hard and physical copy. So many things can look different on the computer - including colors, photos, lettering, etc. Believe me- you want to spend the time to pay for a physical copy to review. * Paragraph indentations- are they consistent throughout your book? * check the chapter headings- are they positioned in the same place every time? are they numbered correctly throughout your book? * can you read your front and back cover clearly? One of the simplest and easiest things to fix to make your self-published book look professional is to make sure that you have title pages. When you open a book you will always see the title pages, copyright pages, dedication pages, acknowledgements, etc. You may think that they are not important but your reader will look and expect them to be there. In a day and age of so many different editing and creative programs there is absolutely no excuse for your cover design to not look professional. Self-published authors feel different ways about this. Some love to spend the time to create their covers and some hate it. I personally love it because it gives me the opportunity to express my creativity, but I still hire someone to help me think through the different aspects that my covers are going to portray. If you like to create your own cover take the time to hire a graphic designer to ask them some questions to help your design look the best. If you don't like to create your own covers, then hire a graphic designer or a professional who works with book designs. Honestly, this and editing are the two most important investments that you must make into your book to make it look professional. I have gone all different routes for my covers, but each one had a specific purpose and theme that I was trying to convey. 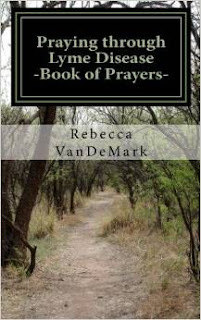 "Praying through Lyme Disease" was my first independently published book and I fell in love with this cover for professional and personal reasons. First, I wanted a cover that was gender neutral and second wanted a cover that conveyed where many people get bit by ticks- in a woods. 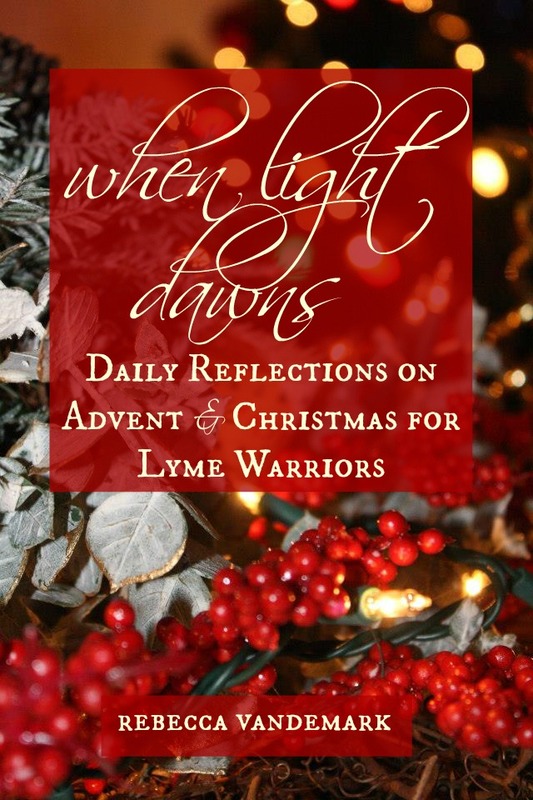 Third even those who don't get Lyme disease by hiking in a woods, the path to healing and through Lyme disease often feels like you are walking a very lonely path through a woods. So this book cover on a professional level hit all of these requirements in my mind. On a personal note when I saw this cover I instantly had tears as I know exactly when I was bit and this looked like the exact path I had been hiking when my life was changed forever. One of the most meaningful things to me about this cover is how many people I have heard from who have are walking the journey of Lyme disease and the cover really spoke to them. That to me is the wonderful thing about a great cover- you will draw the readers you are hoping to - in to your book. 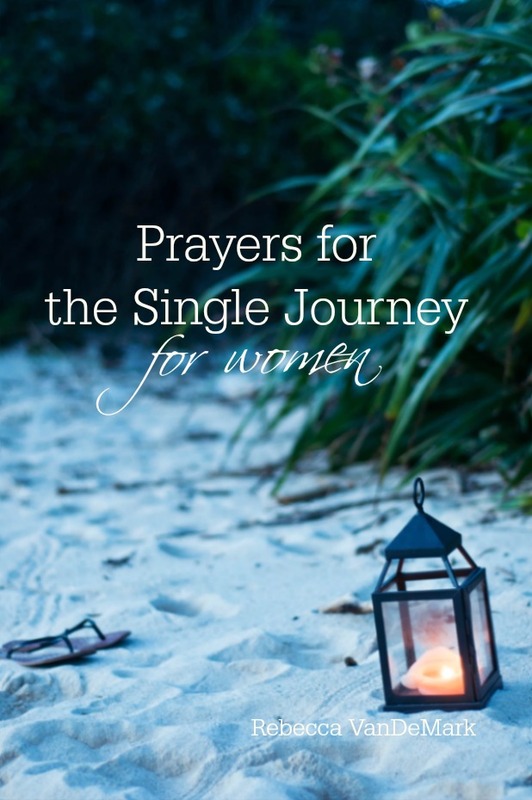 "Prayers for the Single Journey for women" went through about seven different cover designs (literally). The graphic designer that I hired created a fantastic one but to me it wasn't yet "perfect". I created one and running it by different people ... it was honestly just lacking. So we kept trying again and again. In the meantime I kept going back to my sweet friend Amanda's (from Marshalls Abroad) blog and a specific picture that she had taken and posted on her blog. I fell in love with it but was honestly to shy to ask her at first if I could have permission to use it (and pay her for the picture). Finally after the sixth cover design that my team and I threw out I designed that I was going to take the leap and ask her. She was SO sweet and wrote back immediately and gave me permission to use the picture. 24 hours later the cover design was completed after an 8 month process and it was perfect. Professionally it conveyed exactly what I wanted to and personally the picture reminded me of many walks on the beach, praying for my future husband, and dreaming of holding his hand one day. When I first started writing my book, "When Light Dawns" I knew immediately the picture that I wanted to use as the cover. I had taken this picture during the Christmas season, the year before my health crashed completely. I can remember the moment very clearly and had been amazed by the way that the lights of the Christmas tree reflected the birth of Jesus Christ, the light of the world, coming into the darkness. 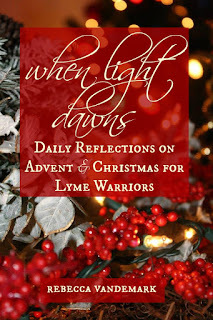 When I first started writing "When Light Dawns" in December of 2013 I needed this beautiful reminder that there was hope during the holiday season. I loved how the picture summed up such a personal journey for me and conveyed not only the color of Christmas, but the theme of light in the darkness. Don't be afraid to explore using your own pictures in addition to using those of others. You never know what picture you may have taken that could be a perfect fit for your cover! I can't stress enough how important it is to really take the time to figure out a cover that will be the perfect fit for your project and that will give it a professional edge! What are some of your tips in making your self-published book look professional? I would love to hear them! I hope that you are having a wonderful Friday friends and that you have a fantastic weekend!